A couple of weeks ago, I shared three of our favorite Halloween books. Today I want to talk about three of our favorite autumn-themed books. These are all new favorites we've discovered within the last month. 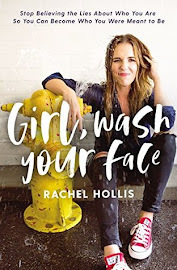 I kind of love it when we find a book with a girl protagonist that we all enjoy. Needless to say, having three sons means that I am well acquainted with books starring dinosaurs, bugs, and ninjas, but not so much with princesses, fairies, and butterflies. This book left out all the pink and lacy frills so that all that was left was the irresistible Sophie. We'll keep her. One day, Sophie is with her parents at the farmers' market and chooses a squash to take home. 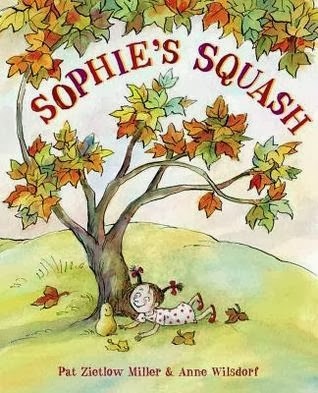 Her parents, of course, think that they will eat the squash for dinner, but Sophie rapidly discovers how nice the squash feels in her arms, how easy it is to bounce on her knee, and how perfect it is to love. When Sophie informs her mother that the squash's name is Bernice, her mother wisely decides that pizza might be a better option for dinner. From that moment on, the two are inseparable. But after awhile, Bernice looks like she doesn't feel the best (her skin is all splotchy), and she's lost a good bit of her firmness and shine. The farmer at the market tells Sophie that squash need "fresh air, good clean dirt, and a little love." That night, Sophie buries Bernice in the soft soil and kisses her good night. Winter passes, and with the arrival of spring comes a tiny sprout that reminds Sophie of someone. (I am rather amazed that she didn't instantly dig it up.) She patiently watches the plant grow until finally she is rewarded with two little replicas of Bernice--affectionately named Bonnie and Baxter. This book reminds me a lot of another one of our favorite fall books, Pumpkin Jack, which is about a young boy who carves a jack o' lantern and wants to keep him forever. Bernice is naturally more portable and lasts longer than Jack, but the lessons of decomposition and renewal are there in both cases. The text in this book is fantastic. There are so many good lines, like this one: "'Well, we did hope she'd love vegetables,' Sophie's mother told her father." Or this one, "Still, as winter neared, Sophie noticed changes. Bernice seemed softer, and her somersaults lacked their usual style." It's one of those books that you could easily start quoting lines from because they're so memorable. 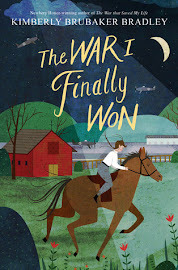 This is actually Pat Zietlow Miller's first picture book, and I'm super impressed. I love an autumn book that incorporates all the seasons, which this one does. It still feels like an autumn book because so much of it takes place during those months, but it also shows that life moves forward and that autumn will return again. I rarely look at a newspaper. (I think the last one I perused was my parents' small-town, once-weekly paper while I was visiting over the summer.) Besides being in the dark about all international, national, and local news (oh, I could get that from the internet? you don't say . . . ), I also don't read any comics. 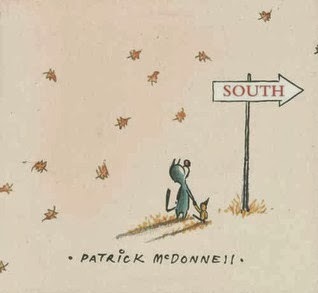 Which means that when we first read South, I had no idea that the cat (I later learned that his name is Mooch) is one of the main characters of the comic strip Mutts. But when Mike picked up this book, he said, "Oh, I love this comic" (he's one of those people who likes to read the newspaper--also news-related sites). So Mike fell in love with this book knowing the comic strip background; I fell in love without knowing anything about it. I'm pretty sure that means any and all people will also love it. The story begins with a flock of birds gathered in a tree. The tree has bare branches save for one lonely leaf. With a last farewell song, the birds take flight, heading south for warmer climates. Then the last leaf breaks free, falling directly on the head of a little sleeping bird. He awakes with a start and realizes that he has been left behind by his family. A friendly cat (aka, Mooch) points which way they went, bu the little bird is so traumatized he can only weep. So Mooch extends his hand, and together they travel by foot through forest and country and city until they hear a familiar song. Although this story is set during the season of autumn and shows what most birds do when the temperatures turn cool and crisp, it is more about kindness and friendship than anything autumn-related. Mooch sacrifices his time and comfort to help his little friend in need. And the little bird recognizes the sacrifice and is filled with love and gratitude for Mooch. There are no words (except for the occasional "weep weep weep," which Aaron always makes me read), but the story is easily told through the simple illustrations. 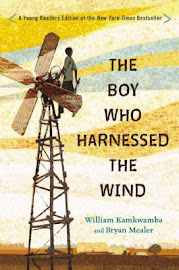 You might remember from this previous KidPages post that I only sometimes like wordless picture books. But this one passes the test: the story is easily understood without any commentary at all, but when I want to "read" it, I can do so by inserting a short sentence here and there. If I ask Aaron how his day was at school, he usually gives as short an answer as possible. So I've learned to ask more specific questions, such as, "Did your teacher read any books to you today? What were they about? What were their titles?" Although he can usually remember the characters and plot, he rarely can remember what they were called. You can imagine what this does to me . . . to hear about a new book (and one that he liked no less) but have no way of tracking it down is agony. So of course I was thrilled when Aaron saw this book in the library bag and exclaimed, "We read that book at school! It is so funny. You have got to read it. You'll love it." One more book mystery solved. And he was right: it is funny. It's all about the signs of fall, but they're all a little mixed up. The leaves are floating up into the sky, the squirrels are flying south for the winter, and the kids are jumping into piles of sticks. 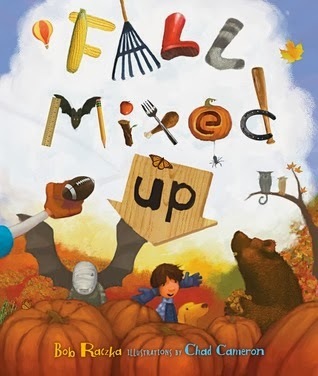 The text is clever and amusing (I love this opening verse: Every Septober, Every Octember, Fall fills my senses with scenes to remember), and the illustrations add to the hilarity (gotta love how the children and animals look with gloves on their ears). The interesting thing to me is that by making everything wacky and wrong, it helps my boys know what is normal and right. We've read a dozen books that talk about the signs of fall (and some of them we really do like), but this one left a more memorable impression because they had to think about what was wrong (squirrels don't fly south) and figure out how to make it right (geese fly south). My kids love saying, "No! That's not right!" and giggling about the neighbors giving out stuffing and drumsticks on Halloween night. It's so great to read a book that is funny and silly while still providing plenty of opportunities for discussion and learning. Now tell me about the great autumn books you've been reading to your kids! What a great list!! These are all new to us! I am STILL waiting for Sophie's Squash from the library! Arg! "South" looks so cute! These are great suggestions.